Some decisions in life take a long time to make. Others come more quickly. Just under one month after receiving an offer from Syracuse football, Ja’qurius Smith accepted the invitation and committed to the Orange this morning. Smith is a three star outside linebacker, according to 247Sports.com. 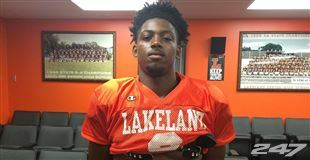 The Lakeland, Florida native is the 47th ranked prospect at his position, 109th ranked football prospect in Florida and 655th ranked prospect nationally, also according to 247Sports.com. At 6 feet 3 inches tall and 194 pounds, Smith is the fifth Syracuse commit from the Class of 2018. Syracuse made an offer to Smith on April 3. He also received offers from Charlotte, Bowling Green, Purdue, South Florida, Western Kentucky, UMass and East Carolina.